​You could spend hours and hours online trying to come to some kind of conclusion about which one to buy. Or, you could take a few minutes to read this review. Because I've already done all the hard work for you! I've gathered together a lot of information about six of the most popular gravity filters: Berkey, Propur, Alexapure, AquaCera, AquaRain, and Zen Water. You'll learn about how they work, how they compare in price, size, and, most importantly, how well they remove contaminants from your drinking water. Hopefully this will help you to make an informed decision and find the water filter that is perfect for you and your family. You can click on a topic in the quick navigation below, or scroll down to read the whole review. How do gravity fed water purifiers work? Do gravity filters remove beneficial minerals? What are the benefits of gravity filters? What are the disadvantages of gravity filters? 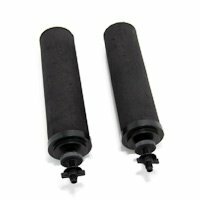 What kind of maintenance do you have to do on gravity filters? Conclusion: What is the best gravity filter? In this table, you'll find the top rated gravity filters along with some basic comparison information. They look pretty much the same, don't they? Well, except for the Zen. 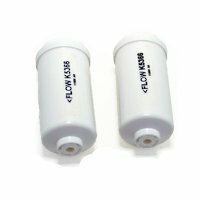 How effective is this water filter in reducing contaminants in the water? And this is where is gets kind of tricky. I downloaded all the available third party lab test results that I could find at the manufacturers' websites. Then I made a table so we can compare how well the systems reduce ​various contaminants. You won't find every single contaminant listed because there are just too many. So I picked out about 40 that would be somewhat recognizable to most people. I also want to point out that I'm not a scientist. I'm a consumer, just like you. But we can read, and we have brains, so we can take the information that's available and try to make a reasonable choice based on that. So, here is the table. The numbers tell you how much the contaminants were reduced by the filters during the test. For example, if it says "glyphosate 75%", that means 75% of the glyphosate was removed, and 25% remained after filtration. Note: Sodium fluoride, hexafluorosilicate, and fluorosilicic acid are all forms of fluoride. I'll talk about these numbers a little bit in the individual reviews. Oh, and in case you're wondering where I got the numbers from, there are direct links to the lab test results in each of the mini reviews below. Okay, now for some more information on each of these systems. 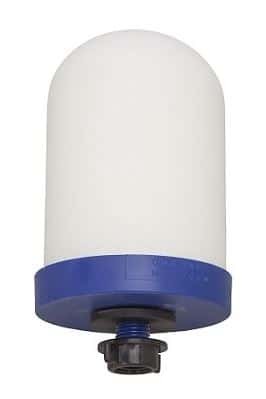 Berkey is by far the best known and most popular brand of gravity filters. This is the brand that my family and I have been using for over eight years. 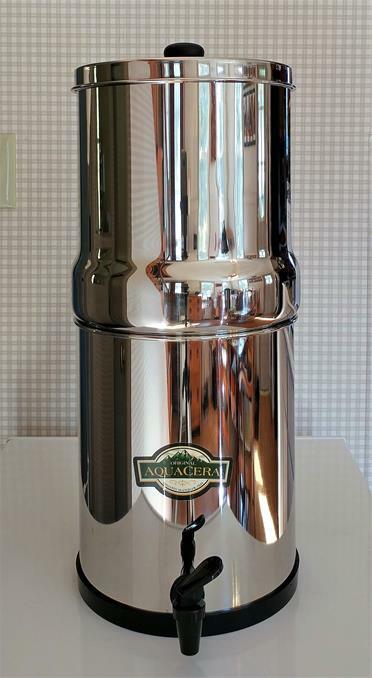 The "Big" Berkey is just one of several available sizes. It's made by New Millenium Concepts, a company in Texas. The filter elements themselves are manufactured in the US, and the stainless steel housing is assembled in the US. It comes with 2 Black Berkey filter elements, which are made of coconut shell carbon plus a proprietary blend of 5 other media. By themselves, the Black Berkey filters will not remove fluoride. If you want to get rid of fluoride, you can buy optional PF-2 fluoride filters to add to the system. Berkey filters have gone through extensive testing by independent labs, and are very effective at removing most kinds of contaminants. They only seem to fall short in the removal of glyphosate, which is an herbicide found in products like Roundup. Black Berkey filters: 3,000 gallons, or about 3 to 5 years. For more information, see my in-depth review of the Big Berkey. 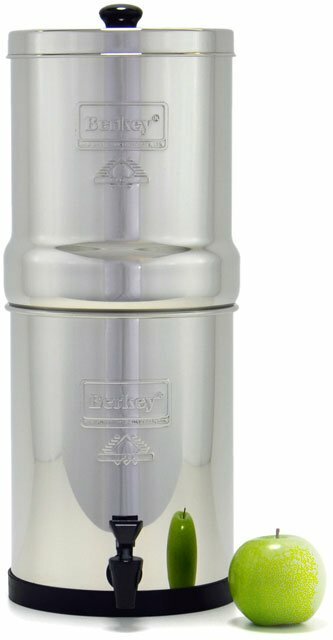 See also The Berkey Water Filter Ultimate Buyer’s Guide for information about the different sizes of Berkey filters and how to choose the right one. You can check the current price and read the reviews at Amazon by clicking here. Sometimes you can find good deals on Berkey filters bundled with accessories or discounts on add-ons at Berkey Filters, an authorized Berkey distributor. They also have deep discounts on scratch and dent models. Click here to go to BerkeyFilters.com. Lab test results for Berkey filters can be accessed here. Next up is the Propur Big. This is just one of several sizes available from Propur. With the system you get two filter elements. ​They're silver-infused ceramic on the outside with a granular activated carbon base medium on the inside. Made in England, by the way. Unlike the Berkey, the Propur doesn't need an extra filter for fluoride. The ProOne G2.0 filter does it all. Like Berkey, the housing is made of stainless steel and is assembled in the US. But it has a stainless steel spigot instead of plastic. Looking at the contaminant reduction table, you can see that it's quite good at removing contaminants. In some cases, it's a little better than Berkey, and in others, it's not quite as good. The main area where it's not as good is in the reduction of radioactive substances. Of all these brands, Propur is the best at removing lead - a serious problem that's been in the news a lot lately. It's also the only one that has been tested for microplastics. Lab test results published in September 2017 show a 99.99% reduction in microplastics. Because the numbers are so close, I've rated both the Berkey and Propur at 5 out of 5. To me, it's really a toss up. See also my detailed review of the Propur filter. It includes information about the various sizes available. Click here to read the reviews and check the current price at Amazon. Access the Propur independent lab test reports here. 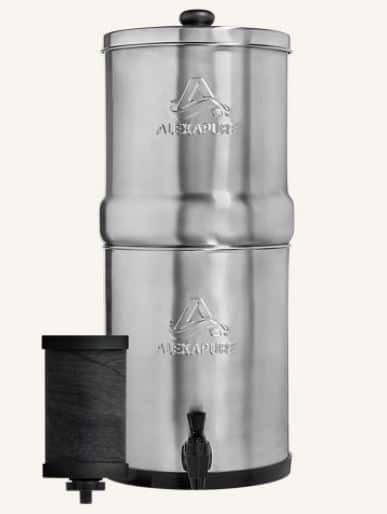 The Alexapure Pro is another gravity filter system that's similar to Berkey and Propur. It's less expensive, though. The main part is stainless steel, and it has a plastic spigot. 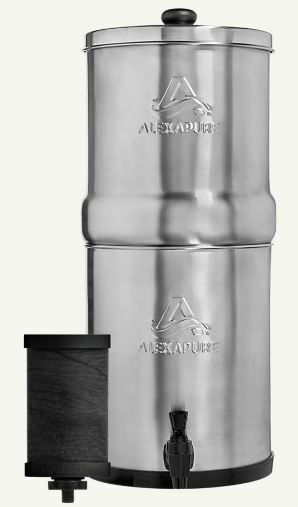 Alexapure comes with a single carbon block filter encased in a hybrid ceramic shell. You can add more filters for a faster flow, if you like. The filter element is made in the US, and the housing is made in India. It's manufactured by an American company called Alexapure and is sold through several online retailers. According to the lab test results, the Alexapure is pretty much on par with Berkey and Propur. It does a great job removing most contaminants, including fluoride and radioactive substances. It's a bit weak in lead reduction, though - only 96.4%. That doesn't seem too bad, but keep in mind that, according to the EPA, there is no safe level of lead in drinking water. That's because lead bioaccumulates in the body. And this is the main reason why I rated Alexapure a little lower than Berkey and Propur. Another thing that bothers me is that there is essentially no warranty on this product. ​You can return unopened products - no questions asked - within 45 days. Other than that, there is no guarantee. They say, "After 45 days, or for products already opened, we will review your return request on a case-by-case basis." I think most people would prefer a more specific guarantee. I certainly would. For more information please see my in-depth review of the Alexapure Pro. Check the current price at Amazon here. The Alexapure Pro is also available from My Patriot Supply. Click her﻿﻿e to view the Alexapure filter lab test report. AquaCera is new to my list of top gravity filters this year. I got a chance to try one out, and I was impressed so much that I thought it should be included. It's similar to Berkey and Propur both in terms of overall design and contaminant reduction. A big difference, though, is that AquaCera gives you more filter options to choose from, so you can customize it to fit your needs. First, there are two carbon block type filters that they call QuickDrip. These are designed to be used only with treated water. One (AquaMetix) removes fluoride and the other (Chemix) doesn't. And then there are two different ceramic filters that can be used with untreated water - CeraPlus and CeraMetix. The CeraMetix filter has a ceramic outer shell with a carbon block interior. It reduces the widest variety of contaminants and could be used as a survival filter. It reduces both chlorine and chloramine, lead, and fluoride, along with many other toxic chemicals. According to the published lab test results, the AquaCera CeraMetix removes 99.99% of pathogenic bacteria and E. Coli, and 100% of cysts. The specific bacteria and cysts are not listed, however, which is why it says n/a in the Contaminant Reduction Table up above. Please see my review of the AquaCera gravity filter for detailed information about the four different filter options and the contaminants they work on. This filter comes in two sizes: the Pioneer, which is about the same size as the Big Berkey, and a smaller unit called the Traveler. Here's a video of me unboxing and using AquaCera for the first time. Check the current price of the Pioneer with 2 CeraMetrix filters at Amazon here. Click here to view the lab test results for the AquaCera CeraMetix filter. 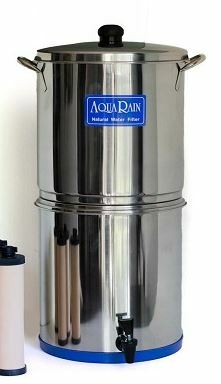 And here we have yet another stainless steel gravity filter, the AquaRain 303. This one comes with 3 filter elements made of granulated activated carbon (GAC) encased in cultured ceramic stone. Silver is incorporated in the filters for self-sterilization. AquaRain is made in the US. You'll notice that the AquaRain has handles on the top chamber. This is a nice feature that makes it easier to lift it up for cleaning and replacing the filters. Now, as far as contaminant reduction goes, ​there isn't a whole lot of data available. The only lab test results published at the AquaRain website are for biologicals and turbidity. At their website, they state that the filter "adsorbs pesticides, organic chemicals, chlorine, tastes and odors." This would be typical of an activated carbon filter, so I have to give them the benefit of the doubt here. But, we don't know how effective it is in reducing inorganic substances like heavy metals or radioactive contaminants. I did send them an email asking if they had any other lab test results they could share, but I haven't heard back from them yet. If they do, I will post an update. It is clear that the AquaRain does not remove fluoride. They have been working on some sort of fluoride filter attachment for the last few years, but it's not available as of this writing. AquaRain could be a good choice if your main concern is removing biological contaminants. I gave it a lower rate than the other stainless steel units because 1) it doesn't remove fluoride and 2) because its ability to reduce heavy metals like lead and radioactive materials is unknown. Click here to go to Amazon to see the current price. For more information see the lab test summary for AquaRain. Finally, we've got the least expensive of the filters in this review: the Zen Water System Model 4G-MP. This is the smallest of the available Zen Water systems. It's different from all the other brands we've looked at in a couple of ways. First, the main part is made of BPA free plastic instead of stainless steel. That means that it's not nearly as sturdy. Second, it does more than just filter. It also mineralizes and magnetizes the water. Filtration: It starts out with a ceramic filter, which you can see in the top part of the unit in the image. Purification: Next, the water goes through a purifying silver infused activated carbon filter and ion exchange resin. ​Mineralization: The water goes through layers of Far Infrared balls, silica sand, and mineral sand and stones. This adds calcium, zinc, iron, and magnesium to the water. It's also supposed to improve your metabolism, memory, and blood pressure, among other things. Preservation: Mineral stones in the holding chamber help to keep the water fresh and pure. Magnetization: At the end, the water is dispensed through a magnetized spigot. This may boost your immunity and improve your overall health. ​Zen Water makes the claim that "the filters in Zen Water Systems effectively reduce over 99% of bacteria, chlorine, herbicides, pesticides and hundreds of other man-made chemical(s)". Also, the Zen is only to be used with potable water. You can't dip water out of a pond and put it through this system, or you'll probably end up sick. I wouldn't use it with well water, either, unless the well has been tested and you're sure it doesn't have any biological contaminants. After searching the Internet, I did find that Water Filter Labs (a division of Natural News) conducted a test on the Zen Water filter. They only tested for heavy metals, though, and the test results are no longer on the website. The results are included in the contaminant reduction table above. You can see that it's almost the same as the other brands, but a bit less effective in removing aluminum. There's no warranty to speak of on this system. They only guarantee that the system will arrive free of damage and defects, or you can return it within 30 days. The lack of a warranty and especially the lack of lab test reports to back up the company's claims are why it's the lowest rated of the bunch. It is going to make your water taste better, and it will remove some contaminants. Plus it's not that expensive. So if you want to spend the least amount of money possible on a decent filter, this might be the one for you. Click here to check the current price of Zen at Amazon. Gravity filters are the simplest kind of filters out there. There's no plumbing involved and you don't need electricity to use them. You just put unfiltered water in the ​top, and gravity pulls the water downward through the filter element(s) and into the holding chamber. No, they don't remove the minerals. Filtration methods that do take out the good minerals are reverse osmosis and distillation. most can filter water from streams, ponds, pools, etc. The only maintenance you need to do is cleaning. You'll need to take the filter elements out​ every now and then and give them a good scrubbing with plain water. After a while, they'll need to be replaced altogether. All of these filters are going to make your water taste good. That's a given. But in terms of structural integrity and effectiveness in removing contaminants, I think that Berkey and Propur are tied for number one. Second place is Alexapure. It's almost as good as Berkey and Propur, but it doesn't do nearly as good a job of removing lead. Plus there's no stated warranty. Third place goes to AquaCera because it seems to be just about as good as the others, but it hasn't been tested as thoroughly. In addition, the filters don't last nearly as long. Fourth place goes to AquaRain.​ It appears to be effective in removing most contaminants, but there isn't enough testing to back it up. And it doesn't remove fluoride. But, if fluoride isn't an issue for you, then you might want to consider it. Last place goes to the Zen Water system. It makes a lot of claims about how great it is, but there isn't much proof. But if you just want a cheap filter that will make your water taste better, then the Zen might be the ticket. Click here to check out the current prices as well as any available offers on these gravity filters at Amazon. If you have any questions, feel free to leave them in a comment below, and I'll get back to you asap.